"The Pak looped a million-mile-wide, harder-than-steel ribbon around a star, and set the ribbon spinning. Like a lariat the scrith band spun evenly, in an orbit comparable to Earth's. Air came, and water and soil, and beneath a sun always at high noon lived and died man-like beings who knew no other reality. Mysteriously, the Pak died out, but upon the Ring there came to be many species with intelligence — Ghouls, City Builders, Grass Giants, Machine People — and their empires and destinies grew bright or dimmed. Then expeditions from the far stars came, changing the fortunes of Ringworld as surely as Ringworld changed Known Space, the little bubble of stars which Earthmen know. With the Ringworld game, you and your friends create and take on the life of one or more Ringworld-bound explorers: riding a starship, bearing the best 29th century gear and weapons, headed on a mission to this bizarre place previously unknown. You have few reports or rumors by which to guide yourselves. Even if (as an explorer) you were fortunate enough to have read Niven's ancient classics concerning this place, you'll find many new intelligent species, dozens of new animals, and alien presences only hinted at. Louis Wu found Ringworld a place of surprises, and so will you. Ringworld is science-fiction author Larry Niven's most famous creation. The authors of the Ringworld game have striven to present it in all its glory and detail." "Ringworld Roleplaying: Following game outlines, players generate and then assume the personalities and physical characteristics of Known Space explorers. These explorers then face challenges and mysteries, as though in a Niven tale. During play, an additional participant, the gamemaster, interprets the Ringworld game rules and manipulates setting, time, the forces of nature, and living opponents. The players determine their explorers' actions; the game rules indicate in an impartial manner how encounters and combats are resolved. A Ringworld game session becomes a drama of successive dangers and triumphs, shared by all. 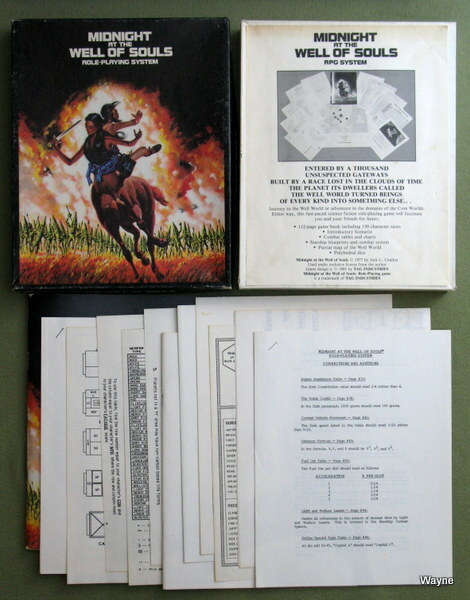 The RINGWORLD roieplaying game contains four books, several handouts, cardstock explorer figures, five dice, and other inserts. Each of the major items fulfills or supplements particular needs. EXPLORER BOOK: explorers travel from Known Space to Ringworld for adventure, fame, fortune, and knowledge. The explorer book contains extensive rules for creating human, Kzin, and Puppeteer explorers. Skills are defined, and all important game mechanics presented. Here also are essays about species, and their major worlds and histories. The lengthy glossary at the back of the book is intended to summarize casual knowledge about Known Space. The explorer sheet-sides on the inside covers are photocopy masters. TECHNOLOGY BOOK: a number of Human Space tools, vehicles, weapons, computers, etc., have been provided so that players can design to some extent their explorers' capabilities. With this book and the explorer book, players have everything their explorers need to visit Ringworld — except a starship. The gamemaster provides the interstellar transportation; deck plans exist as part of the scenario in the gamemaster book — permission is granted to photocopy the deck plan pages. Atmospheric and interplanetary craft are included in the technology book. CREATURES BOOK: this book is intended mostly for the gamemaster; here is a selection of aliens, Ringworld hominids, and Ringworld animals, and their relevant statistics. A lengthy essay puts the achievements and goals of the Pak in perspective. GAMEMASTER BOOK: also for the gamemaster, the book contains many essays about the structure and intent of Ringworld, an augmented Ringworld printout, a scenario generator in the form of unanswered mysteries of Ring-world, a short selection of Ringworld hominid technology (including archaic weapons and their statistics), an extended scenario, gravity rules, psionics rules, and a short GM glossary for Ringworld and the voyages of Louis Wu (the gamemaster should carefully examine the player glossary as well). HANDOUTS: (1) A four-page set of reference sheets contains most of the tables needed for playing the game. (2) Stapled together are two separate items. 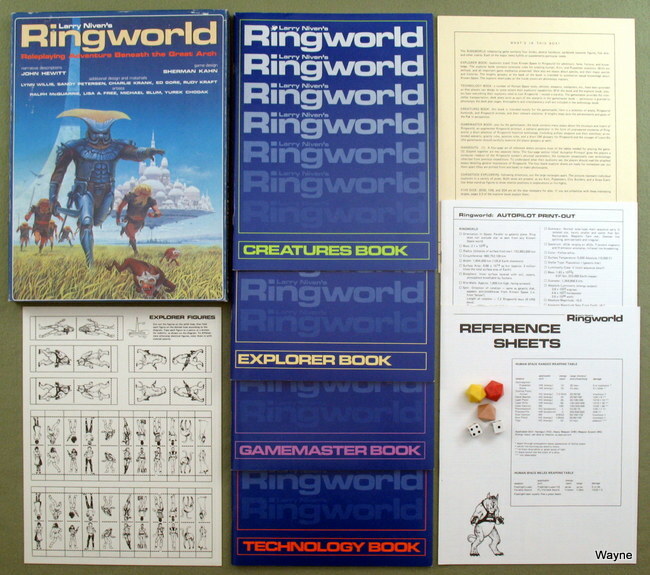 The four-page section titled 'Autopilot Printout' gives the players a computer readout of the Ringworld system's physical parameters; the computer occasionally uses terminology inherited from previous expeditions. 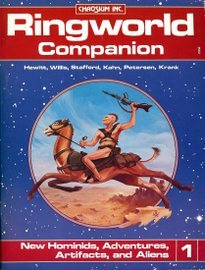 To understand what their explorers see, the players should read the attached essays detailing general impressions of Ringworld. The four blank explorer sheets are ready for immediate use: cut them apart (they are printed front and back) or make photocopies. CARDSTOCK EXPLORERS: following directions, cut the large rectangles apart. The pictures represent individual explorers in a variety of poses. Both sexes are present, as are Kzin, Puppeteers, City Builders, and a Grass Giant. Use these stand-up figures to show relative positions in explorations or fire-fights. FIVE DICE: 2D20, 1D8, and 2D6 are all the dice necessary for play. If you are unfamiliar with these interesting shapes, pages 2-3 of the explorer book explain them." "About the Box Front: a crystal dawn, and a war band of Grass Giants lopes across the Ringworld plains, accompanied by ubiquitous scavenger dar'los. The chieftain-giant leads, in battle-worn armor. To the left and above the warriors fly observers for the City Builders. Some 10 kilometers beyond floats the City Builder enclave, a survivor of the horrible Fall-of-Cities. Aerial traffic around it is visible. To the right rise the awesome rim mountains; beyond them is a glimpse of the rim wall itself, 10,000km distant. To the top of the frame and millions of kilometers away soars the full magnificent width of Ringworld, with its characteristic day/night divisions. Painting by Ralph McQuarrie." Announced in a 1984/85 Chaosium catalog. "The City and Jungle - An unfallen Citybuilder City surrounded by a vast rainforest - intrigue and adventure! Known Space - The galaxy outside of Ringworld!" "Jarid Markov discovered the first of these ruins centuries ago on a planet over a hundred light-years from this spot. It was our race's first experience with signs of intelligence in this galaxy of ours, and the discovery caused a tremendous amount of excitement. Those ruins were dated at over a quarter of a million standard years old, and they were the youngest discovered to date. It became obvious that, while our race grubbed on its home world fiddling with the discovery of fire, someone else, these people, had a vast interstellar empire of still unknown dimensions. All we know is that as we have pressed inward in the galaxy these ruins get more numerous. And, as yet, we haven't a clue as to who they were." See my review of the Well World fiction series over at our sales site blog. you and your friends for hours. "...The concept behind the game is great and the designers give you enough background information to get started on a campaign of your own. While I haven't had a chance to run a game yet, the mechanics seem decent enough, they even have multiple methods of character generation. With such a wide open universe of over 40 worlds, it is unlikely that you'll fall short of adventure Ideas. The book has a good format, easy reading and pretty nifty art too. However, the creators of the game are also the original developers of White Wolf's Vampire and Werewolf games, so prepare yourself for a healthy dose of angst ridden melodrama. Whatever your playing style, whether it be the afore-mentioned melodrama or an intense high action thrill game, Fading Suns offers a lil' something for everyone..."
"Humans reached the stars long ago, building a Republic of high technology and universal emancipation -- and then squandered it, fought over it, and finally lost it. A New Dark Age has descended on humanity, for the greatest of civilizations has fallen and even the stars die. Now, feudal lords rule the Known Worlds, vying for power with fanatic priests and scheming guilds. * a morality play reveals how demons tempt mortal souls with the lure of high-technology and riches from the stars"
"Fading Suns is a future fantasy game of epic adventure and high tragedy. It's far-future setting allows stories from many genres: fantasy, horror, post-apocalypse, and more. Characters wield swords and blasters and fly starships to lost worlds, ancient ruins, verdant jungles or blasted wastelands. 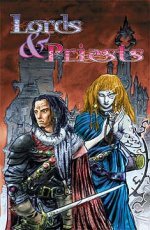 They encounter conniving nobles, vain priests, cunning merchants, bizarre alien creatures, evil occultists, and bodiless entitites from across gulfs of space and time. In other words, Fading Suns has everything a roleplaying game setting could possibly need. The Second Edition hardcover rulebook includes new rules adjustments based on the extensive playtesting and suggestions by players from all over the world, as well as new history, psychic powers and rites, and extensive equipment rules." "A valuable expansion to the Fading Suns rules, this big book includes new Blessings and Curses, Benefices and Afflictions, skills, occult powers, weapons, equipment and valuable rules expansions. In addition, there are new character roles: Knightly orders, Church sects, new religions, guilds, military units, details on sentient alien races and the genetically engineered Changed. A must for players and gamemasters!" "Gamemasters Screen: A sturdy and comprehensive screen with charts to help gamemasters run dramas. Includes all the important Second Edition rulebook charts and tables, along with evocative art to ignite the players imagination and interest. 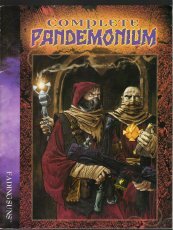 Complete Pandemonium is a sourcebook providing Fading Suns gamemasters with details on the planet and its capitol city, the Hub, along with two beginning dramas to inflict on players." 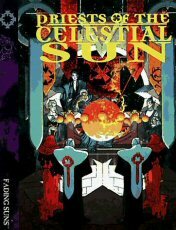 "A compilation of two of the most popular (and out of print) Fading Suns sourcebooks: "Lords of the Known Worlds" and "Priests of the Celestial Sun." Includes 10 pages of new material." "The nobles and the Church may vie for the leadership and minds of the Known Worlders, but the merchants own the stars. Without their high-tech savvy or the loans from their coffers, travel and commerce could not take place. This book details the histories and modus operandi of the Merchant League guilds, from the weird Engineers to the stately Reeves." "In the far-future Fading Suns universe, might equals power. No one rules for long without military might to back him up - even the Patriarch has a fleet of battle cruisers! 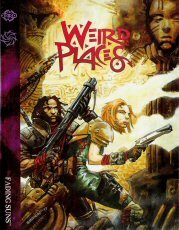 This book brings out the Known Worlds' most dangerous people and places with a bang, allowing gamemasters to put players in the middle of the bloodiest conflicts against the most feared warriors - including the Symbiot-fighting Stigmata Garrison! New weaponry and war tech provide numerous excuses to blow things up." "Emperor Alexius has sent his Questing Knights forth to bring back reports from all quarters of the Known Worlds on the state of his empire. 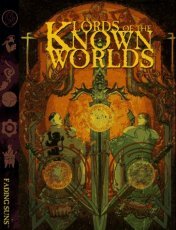 The first volume surveys the Hawkwood Fiefs - home to Alexius before his ascension and center of intrigue for one of the Known World's major powers. The Hawkwood way of life is revealed at such places as the Deepcore Cities on Ravenna, Ice Wyrm-ridden Frisia on Delphi, the massive mountains of Gwynneth, and the backwoods of barbaric Leminkainen." "The second volume surveys the al-Malik Fiefs - home to the prosperous al-Malik, allies to the Merchant League and Emperor alike. The al-Malik way of life is revealed at such places as the bustling streets of metropolitan Criticorum, the Shantor reservations of Shaprut, Prophet's Hill on Aylon, and the Great Market amid the deserts of Istakhr." "The third volume surveys the Hazat Fiefs -- home to the militant Hazat, leaders of the star crusade against the heretical Kurgan Caliphate. The Hazat way of life is revealed at such places as: Sutek, humanity's first new world during the First Republic and home to untold Ur ruins; Aragon, seat of Hazat power; deceptively placid Vera Cruz; and war-torn Hira." "The fourth volume surveys the Li Halan Fiefs -- the Garden Worlds of the Most Illustrious Family of Supreme Merit, ruled by lords who trace their lineages back to the ancient Eastern empires of Urth. The Mandate of Heaven colors all aspects of Li Halan life from the deserts of Kish, the mysterious mountains and ghost-haunted cities of Icon, the dragon-favored dells of Midian, to the rebellious enclaves of Rampart." "The setting book details the center of the Known Worlds, the capital and seat of the Empire. There is no more important or intrigue-laden world, for here the fates of millions are determined and the destiny of humanity is in the hands of the royal ambassadors, Church priests, merchant princes, alien envoys and underground conspiracy groups - all vying for the Emperor's attention and favor. Includes new character roles for the Imperial Eye - the Emperor's intergalactic spies." "Explore some of the varied sites of the Fading Suns universe: Roam the strange fields of Pentateuch, a planet terraformed with occult laws. Discover a secret world hiding a powerful artifact sought by all. Shop the stalls of the eclectic Istakhr Market, where everything is for sale. Or dock at Barter, a traveling marketplace in space. Ship out to Bannockburn to halt a deadly Symbiot excursion, or search the haunted chapel of Manitou for lost lore." "Ever since the Vau gave humanity its first setback among the stars, their space has been shut to prying eyes. For a brief moment, however, it has opened - long enough for the most daring to catch a glimpse. But the daring need as much wisdom as courage, for encounters with the Vau teach that things are not always what they seem." "Every Known Worlds peasant and priest knows to fear the unseen powers of the Dark, the nemesis of the Empyrean Light. So why do so many adventurers seek out the unknown, unexplored regions of space, risking their lives and souls for material gain? Are they insane? Stupid? Or are they fearless foes of ignorance and superstition? Perhaps all of these things at once. Into the Dark provides five meaty dramas and numerous short adventures that pit characters against the unknown, testing their mettle in a crucible of terror or triumph - only they can choose which it will be." 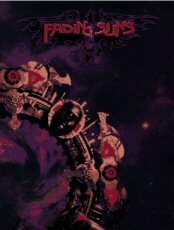 "The weird world of Fading Suns technology is revealed, from starships to ominous psychic artifacts. But beware: the Church claims that such items can endanger the soul, and the Inquisitor's flameguns are ever ready to burn those who dare to use such proscribed and sinful tech. Includes enough equipment lists to choke a Vorox." nobles and guilds, they feud within their cathedrals, vying for dominion over the faithful. Herein are detailed the lives of the saints, the histories and beliefs of the major sects of the Church, the heretical Incarnates and the religion of the Children of Zuran." The quest is on: Emperor Alexius has sent forth the Company of the Phoenix to rediscover the lost worlds of the Second Republic, to reach once more for the stars and to welcome humanity's distant kin into the fold of imperial destiny. But these worlds have been separated for centuries and greatly differ from the Known Worlds. Each answered the challenges of the Fall and intervening years in unique ways. Some now pose ideological threats to the political and religious powers of the Known Worlds, or hide secrets that, once exposed, could radically tip the balance of power between starfaring empires. 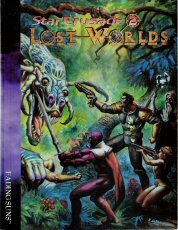 Lost Worlds is a companion volume to the Star Crusade sourcebook, detailing the independent worlds of barbarian space – each now up for grabs with the opening of the jumpweb, 16 planets are featured, along with new sentient alien races: the fongal Muazi, the silicate Ming and the energetic Z'go." "Operating under Letters of Marque, authorization from noble houses to hunt rivals' ships, privateers seek out and capture enemy ships. Troopships specialize in boarding parties, marine units trained to seize ships by swinging across grapple lines and entering breeched hulls, taking the fight to the enemy with sword and blaster. 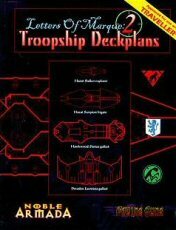 Letters of Marque 2: Troopship Deckplans is a collection of deckplan maps for use with the Noble Armada miniatures game or the Fading Suns roleplaying game  it has also been approved for use with Traveller®! In fact, it can be used with just about any science fiction game. Four starships are featured, each depicted on 25mm-scale maps  perfect for detailed boarding actions or roleplaying game firefights from corridor to corridor, stateroom to engine room. • Decados Lucretzia class galliot (three 17" x 22" maps)"